When my publisher asked me to take a fresh-eyed look at my Charlotte McNally books in preparation for their re-issue—my first series in all new editions with gorgeous new covers!—I knew that could be a…shall we say, fascinating experience. I could change things if I wanted. Yay. But I would also see—in unassailable black and white--what needed to be changed. Would that be the good news or the bad news? So with much delight and little trepidation, I opened the pages of the four books in my first series, and read all the way through. 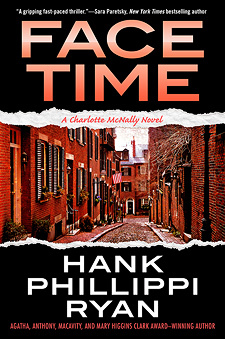 PRIME TIME came out in February, and I am so happy Charlotte McNally is making friends with lots of new readers. First, the fabulous news. Were you hooked on Serial, or Making A Murderer, as I was? 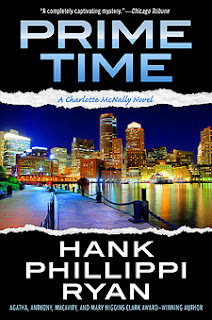 It turns out that the Serial and Making A Murder theme is what FACE TIME is all about! So that was a treat to discover. However. It was quite the education to see what needed to be changed in the books. It’s like watching a movie from 9 years ago. Things that seemed so timely and hip become…well, not so relevant. First, in AIR TIME (coming in June) I had to change the announcement flight attendants make before takeoff. You don’t have to completely turn off your phones any more, right? You can keep them in airplane mode. That almost ruined a plot point—it was very nice to be able to have the flight attendant yell at Charlotte to power down. n PRIME TIME, someone’s computer proclaims “You’ve got mail!” Uh, hmm. When was the last time you heard that once-constant refrain? So now I made their email ping. But a person still says “You’ve got mail.” The “you’ve got mail” reference is critical later in the book, so I couldn’t ignore it altogether. But because a suspect wears an item from his Sean John clothing line and that leads to his identification, it was a real key to the story. 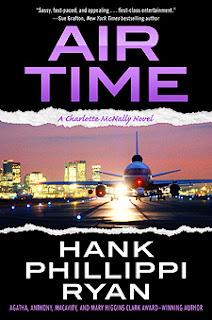 (You’ll understand when you read AIR TIME. It works.) So I had to keep it—but how? “How do you even know about P. Diddy?” someone now asks. The crazy-crowded Cape Cod rotary is now gone. Luckily Charlie doesn’t have to use another route to be caught in the traffic jam. The toll booth on the Mass Pike are now mostly unstaffed E-Z pass automatic machines—happily for me, not ALL of them. My editor back then yanked out all the current cultural references, much to my chagrin at the time. I remember telling her: “Jane Pauley will ALWAYS be on the Today Show!” Okay, the editor was right. Big lesson learned. Some things I just left the way they were—I mean, Charlie is 46, and her mental rolodex would be that of a person that age. So she refers to the Beatles, and Ed Sullivan, and having had a collection of VHS tapes twenty years ago. “Josh is getting cable,” I say. “Josh is upgrading his cable,” I say. Time to hit the pay phone. Happily, Logan still has one pay phone. In this scene: our heroine, reporter Charlotte McNally, is not only facing a last-minute TV live shot about a new political candidate, but a disaster only possible to people of a certain age. then head for the Oval Office at 1600 Pennsylvania Avenue. darkens his coffee skin to espresso. go on the air wearing them. “Thirty seconds,” I hear in my ear. again to read Oz’s formal announcement. 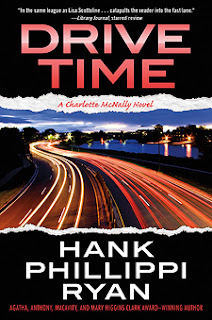 HANK: SO excited about this! And soon I will have fabulous other news. And—soon--there’ll be the brand new SAY NO MORE, about which you will hear, um, relentlessly. I'm working on the updates to DRIVE TIME now…and I will keep you posted. But let’s talk about change. If you had a do-over—about anything—would you? Or how about this: Would you mind if I’d mentioned the Cape Cod rotary or Jane Pauley? And—a copy of the all new PRIME TIME to one lucky commenter!